Alistair Campbell stumbled on his words. For the first time I have ever seen, he has lost his cool. 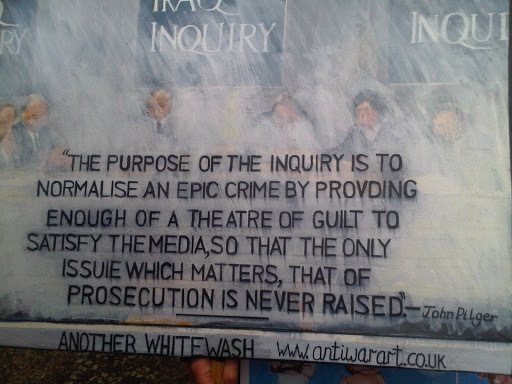 But this wasn’t during the Iraq Inquiry. Like Fern Britton, the ‘morning political heavyweight’ who tackled Tony Blair a few weeks ago, Andrew Marr sleighed yet another New Labour Dragon on the sofa. Campbell regained his composure during the Sunday morning roasting, and blamed the persistent line of questioning for his hesitation; the media is out to get him, a claim reiterated on the couch with the Loose Women on Tuesday. But the real questions, it seems, are being asked outside of the investigation. Blair was made Middle East Peace Envoy for the UN, the EU, the US and Russia on the day he left office in 2007, (yes, after Afghanistan and Iraq), yet he took the photo-opportunity to condemn Iran throughout his evidence. He spoke of “security”, “fear”, “risk” and “attack” but just how alarmed should we be? After all, the Iraq War was supposed to make our streets safer? Almost as unclear as some of Blair’s justification for war; “What if the intelligence was right and we hadn’t acted?”, “If Saddam was getting WMDs, I thought he might attack the UK”, “It wasn’t something that people disputed at the time”. “The relationship with the US is vital for our security” Blair urged, “I didn’t want America to feel like it was doing it on its own”. Since Barack Obama came to power, he has distanced himself from any “special relationship” with the UK. Probably out of coolness, to shake off the International Lap Dog. Ultimately Tony Blair’s defence of the ‘intelligence’ on Weapons of Mass Destruction was, “I believed it, beyond doubt”. From Thatcher to the height of the Blair reign, the position of prime minister has centralized to the point where Blair allowed his own judgment to be the justification. David Cameron is reportedly checking all Tweets made by his shadow ministers in the run-up to the general election. The lines of question were often probing: “Whose advice were you listening to who didn’t agree with you already?” Chilcot queried. Blair was also lead around a series of “Why Iraq, why now questions”. But to the dismay of the 700 people who thought they had the golden ticket, they couldn’t get the same answers Fern Britten had pleasantly posed before he appeared. One only need see the sign of a protester outside the building to see what ‘the world’ might now think: “7 million Iraqis killed, injured or made homeless since 2003”. Associated Press estimated last year that more than 100,000 civilians had been killed, but for every innocent person, there are relatives who have lost a loved one, looking for somebody to blame. A protester was restrained trying to perform a citizen’s arrest on Blair, influenced by arrestblair.org, a website offering a reward to people “attempting a peaceful citizen’s arrest” on Mr Blair “for crimes against peace”. But he left without detention. Peter McKay said in the Mail “Perhaps we need an inquiry into inquiries themselves — how they are set up, why some people are chosen for them above others, and the true motives of those who decide to have them.” And, apart from the format being the obvious flaw, I’m afraid he might be right. The Metropolitan Police declined to comment on how much the policing of Blair’s Second Coming had cost. But a helpful Met Police Officer who had been drafted in for the day said that just outside the building there were more than 150 officers- four higher ranking officer per patrol of 21. You do the maths. This entry was posted in alistair campbell, Andrew Marr, Barack Obama, citizen's arrest, fern britton, Iraq Inquiry, Metropolitan police, special relationship, Tony Blair, UK, United States on February 15, 2010 by kirstystyles1.